The SAVER Program is a strategic pilot program working towards sustainable climate change adaptation and disaster risk reduction using geo-spatial techniques. The “Climate-Smart Agriculture in National Context: The Case of the Philippines” is a publication by the OML Center and the World Agroforestry Centre. It is an infographic poster on climate-smart agriculture in the Philippines context. It is comprised of five divisions that discuss (1) national circumstances, (2) adaptation in the agricultural sector, (3) mitigation, (4) relevant policies for mainstreaming, as well as (5) experiences and challenges. 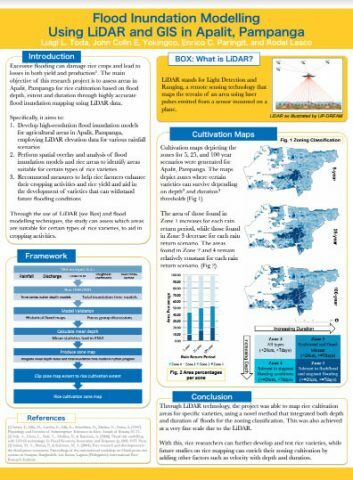 The “A Spatial Approach to Vulnerability, Exposure and Risk Assessment” discusses the OML Center’s banner program on Spatial Analysis of Vulnerability, Exposure and Risk (SAVER), which highlights the focused-research on agriculture. It emphasizes the need for scientifically sound methods for targeting adaptation interventions particular to Pila, Laguna. The poster was part of the OML Center exhibit held at the sidelines of APEC Senior Disaster Management Officials Forum at the Diversion Hotel in Iloilo City on September 21-22, 2015 and at the 4th National Climate Conference at Hotel Jen, Manila on September 23, 2015. The “Flood Inundation Modelling Using LiDAR and GIS in Apalit, Pampanga” poster presents the results of one of OML Center’s banner projects Flood Inundation Modelling Using LiDAR and GIS (FIMULG) which focuses on the use of LiDAR and GIS for rice agriculture. The poster was presented during the APEC 2015 event Senior Disaster Management Officials Forum at the Diversion Hotel, Iloilo City September 21-22, 2015. The poster was also presented during the NAST 4th National Climate Conference at the Hotel Jen, Manila September 23, 2015. The “LiDAR and Flood Mapping for Optimal Rice Varietal Cultivation” SP brief explains what Light Detection and Ranging (LiDAR) is and how it can be used for rice agriculture in flood prone areas through flood modelling and Geographic Information Systems (GIS) techniques. This policy brief presents the results of the OML Center’s banner project Flood Inundation Mapping using LiDAR and GIS for Apalit, Pampanga. 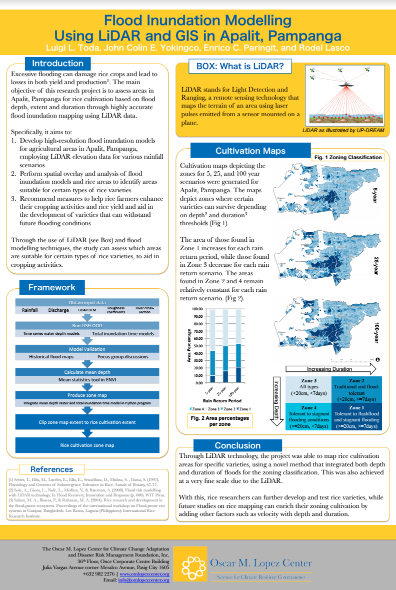 The “Mapping of appropriate rice cultivation zones for flood-affected areas in Apalit, Pampanga using LiDAR and LISFLOOD-FP” poster was presented at the Regional Forum for Climate Change at the Asian Institute of Technology in Bangkok, Thailand on 1-3 July 2015. The “Mapping Appropriate Rice Cultivation Areas in Apalit, Pampanga Using Flood Inundation Mapping with LiDAR and GIS” infographic summarizes a study that demonstrated the use of flood inundation mapping with LiDAR and GIS to map appropriate rice cultivation areas in Apalit, Pampanga.